Rope Cross Bird Perch-25 Inches. The soft and colorful Comfy Perch Cross can be bent into unique forms that hold shape without dangerous wires or stiffeners. A easy way to situate perches in normally difficult places in the cage. Form a cross or other unusual shape, that would be impossible to do with a wooden perch. Designed to sooth your bird's feet while affording fun exercise opportunities. The multi-color Comfy Perchª will fit any size or style of bird cage, so let your bird go wild! 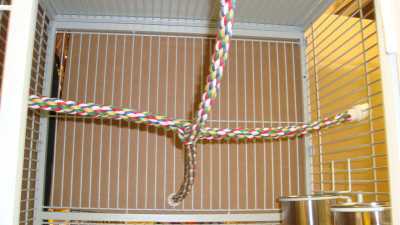 5/8" Diameter X 25" For Small Birds such as Parakeets, Canaries, Finches, Cockatiels, Small Conures, Etc. 7/8" Diameter X 25" For Medium Birds such as larger Conures, Amazons, African Greys, Small Cockatoos, Eclectus, Etc. Choose the perch that best fits your bird's species size.